Welcome to JConsume home page! 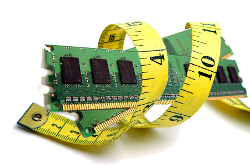 JConsume 2.0 is a memory consumption analyzer for Java bytecode. It computes parametric expressions that over approximate the maximum number of simultaneously live objects ever created by a method, where by live we mean irreclaimable by any garbage collector. Computing the number of live objects is a key underlying step in all client analysis techniques aiming at computing dynamic-memory requirements. JConsume implements a new compositional quantitative analysis aimed at inferring non-linear upper-bounds on the number of irreclaimable objects that may be stored in the heap at any point in the execution of Java-like programs, including polymorphism and implicit memory management. The analysis is based on the compositional construction of live objects summaries for every method under analysis. More concretely, it over-approximates both a) the maximum amount of fresh objects which are simultaneously alive during the execution of the method and b) the number of created objects that may remain alive after the method finishes its execution. Summaries are built up using method local information (e.g., their own allocations) and precomputed summaries of called methods. Since the behavior of a method can vary a lot with the arguments it is called with, summaries are parametric in order to provide bounds that can depend on the arguments. The call to the method apply at line 5 is inside a loop. Therefore, we resort to an invariant to characterize the iteration space corresponding to that statement: Inv5 =1≤i≤list size where list size is a formal variable representing the length of the list (i.e., list.size). Objects escaping from apply will live in map’s scope. Clearly, such number contributes to MaxLive of map. Thus, the amount of escaping objects from apply at each iteration must be accumulated as it contributes to the total amount of live objects in the scope of map. Besides, objects not escaping from apply are also alive during (part of) the execution of map. Therefore, they should also be counted in MaxLive of map. However, since the number of those objects may be different at each iteration, it would be sufficient to count only the maximum such number over all iterations to obtain an over-approximation. Notice that we subtract the number of escaping objects from the overall num- ber of live objects of apply since this amount is indeed accounted for in the SC.Summate. Let us look now at Esc5. All objects escaping from apply are added to the returned list. Consequently, they also escape from map.